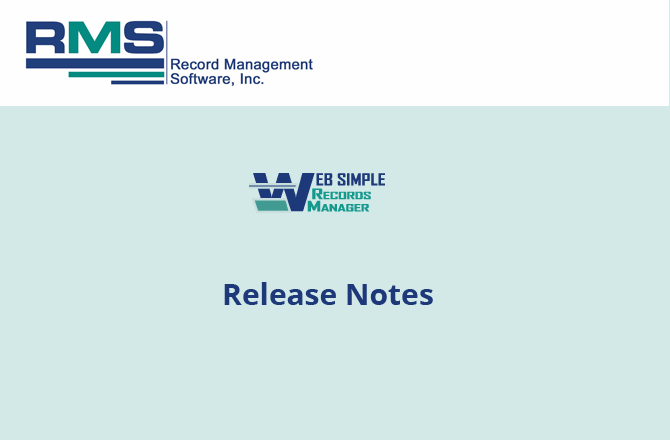 The following fixes and enhancements were implemented in Web Simple Records Manager Version 5.0.7 released on 06/02/2015. A major enhancement has been added to the box list allowing for selection of multiple boxes for mass checkout. A major enhancement has been added to the file list allowing for selection of multiple files for mass checkout. The Box report has been reconfigured to allow for a longer string of comments text across the row. The Refresh / Remember Key Fields in files have been augmented to carry the matter number field forward. The File edit screen has been corrected to allow cancel of edits when modifying a duplicate file. In File Labels, the file list that appears when selecting the criteria ‘Choose Individual Files’ has been updated. In Box Labels, the box list that appears when selecting the criteria ‘Choose Individual Boxes’ has been updated. The Mass Destroy Boxes utility has been revised to add multiple warnings that the process will destroy all boxes prior to and including the destroy date entered. Edit of files has been updated to prevent time out errors.